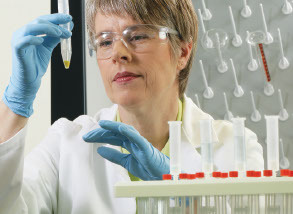 From routine monitoring of chemical and elemental compounds to food safety, nutritional research, and food label testing our portfolio offers options that fit your requirements. Our instruments provide sensitivity and robustness as well as efficiency for all your nutritional and food label testing needs. This application note shows an ion chromatography (IC) determination of chloride in 19 SPIFAN (Stakeholder Panel on Infant Formula and Adult Nutritionals) matrices, including fortified and placebo products. Although the body produces choline, a choline-rich diet is necessary to meet dietary needs. Therefore, infant formulas and adult nutritional products are fortified with choline..
Organic acids provide the freshest, purest tastes while other acids play a minor role in fermentation and contribute milder, more complex flavors. Learn how using discrete photometric analyzers can reduce hands on time and produce less waste. Learn about an efficient high-performance liquid chromatography (HPLC) method for simple and sensitive determination of retinol (vitamin A), cholecalciferol (vitamin D3), and tocopherol (vitamin E) in milk-based nutritionals such as infant formula, adult formula, milk, yogurt, and cheese. Isohumulones form approximately 80% of the typical bitterness of beer. Their antimicrobial effect leads to a sterile beverage, their tensioactive character stabilizes the foam, and they have a major influence on the general flavor, smell, and smoothness of beer. Edible oils are among the most abundant cooking ingredients in the world. They are used in baking and frying food and for products such as salad dressing, margarine spreads, and dips. In addition, edible oils are used to produce nonfood products such as cosmetics and as a feedstock for making biodiesel fuel. In December 2008, the U.S. FDA recognized rebaudioside A purified from Stevia rebaudiana (Bertoni) as Generally Recognized as Safe (GRAS) for use as a sugar substitute in foods. Since this recognition, stevia products have become popular as table-top and beverage sweeteners. Luo han kuo fruit has long been used in traditional Asian medicine. Recently cucurbitane-type and other triterpene glycosides have been isolated from the fruit and investigated for numerous potential health benefits such as antioxidant activity, anticancer effects, and antihyperglycemic effects.